This months Owlcrate I was so excited for, and its theme was Castles, Courts, and Kingdoms. The first thing we have is a Harry Potter "Expecto Patronum" Beanie to keep you warm for the winter. Next is a notebook with an A Court of Mist and Fury quote on it which reads "Don't let the hard days win". Up next are two Owlcrate exclusive items, the first being a magnetic Grisha pin from the Grisha Trilogy and also Winter is Here lip balm which is inspired by Game of Thrones. Lastly is a bar of soap that is shaped into leaves and is in the scent of Elvin Bread from the Lord of the Rings series. 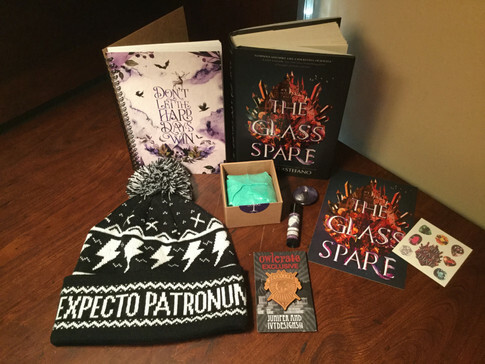 Finally is the book of the month, The Glass Spare by Lauren DeStefano, which comes with a letter from the author, a signed bookplate, and the pin of the month.